Silver Waterfall, a popular destination for tourists in the country’s northwest region. LÀO CAI — Travellers to the northern upland province of Lào Cai seeking a place to experience a slow pace of life should visit Bạc (Silver) Waterfall, a must-see destinations in Sa Pa town. 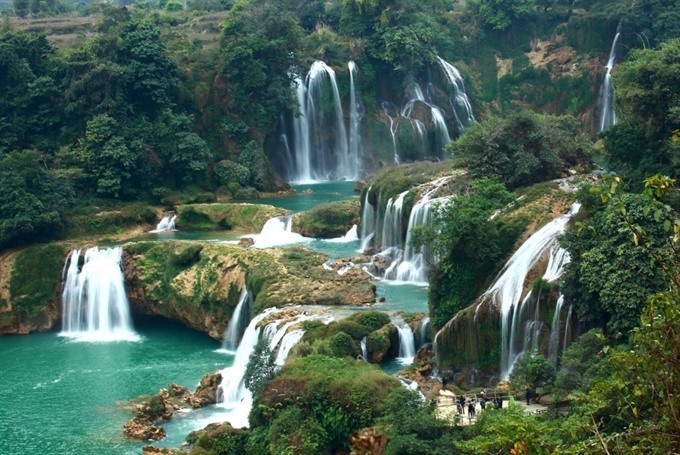 From the waterfall, tourists can admire a splendid view of a valley at the foot of the Hoàng Liên Sơn Mountain Range. From town, tourists can take a motorbike to cover the 12km to Bạc, admiring the beautiful landscapes on either side of the street. On arrival at the waterfall, they can enjoy the balmy weather, which will refresh their minds and souls, and admire the immense green of the mountain range and the endless glistening yellow of terraced rice fields. The waterfall is a harmonious combination of nature and life waiting to be discovered. The place is home to a large community of ethnic minorities such as the Mông, Dao, and Giáy with charming cultures and lifestyles. Many locals gather at the foot of the waterfall to set up a small flea market to sell their specialities to tourists. Tourists can also enjoy corn wine and grilled dishes such as pork, eggs and corn.